It was my birthday the other day. 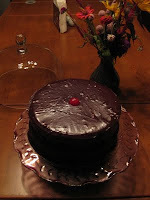 My husband made me a wonderful, chocolatey, rich cake with fudge icing. 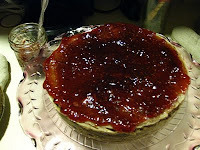 He used almost an entire half-pint of raspberry jam for the middle. It's AWESOME. It reminds me of our wedding cake except the frosting is better on this one. And the kids even let me eat the cherry. Now, that's love! I'm glad you liked it, but better than our wedding cake? No one is going to believe that because (cue sappy music track) they can't taste the love I baked in. (cue sappy audience 'awwwww' track).